WINDHAM — A draft agreement for the school district to lease space in the town’s new shared vehicle maintenance facility was presented to both the Windham Town Council and RSU 14 board this week, nearly 10 months after Windham voters approved the project and more than three months after construction started at the new facility. The vote by Windham residents in favor of the new facility last November approved $9.3 million in bonds for the project, which is projected to cost more than $12.9 million with interest. “That project was approved, and we’ve been working on the agreement since not long after that,” Plante told the council at its Sept. 4 meeting. When asked by Chairwoman Donna Chapman why the agreement has taken this long, Plante cited scheduling challenges among the various parties involved. The draft agreement was the product of various back and forth between the town, district and both parties’ lawyers. The town is represented by law firm Preti Flaherty and the district by Drummond Woodsum. Great Falls Construction of Gorham began work on the facility May 1 with clearing and excavation. Plante said in June that the project at 185 Windham Center Road will be completed in two phases, first to complete the new building and then to remove the existing building on the same site. The facility will house the town’s Public Works Department vehicles and the RSU 14 school bus fleet. The draft proposal includes both a 40-year inter-local agreement between the two entities and a lease agreement that would need to be renewed every 10 years. The agreement is structured with the town of Windham owning the facility and operating as the landlord, and the district will have approximately 4,800 square feet for its exclusive use, along with access to shared and common space in the facility. The town will have nearly 19,000 square feet of exclusive space, meaning that approximately 75 percent of the building’s exclusive space will be used by the town and 25 percent by the school district. The school district’s fixed rent will be calculated based on that percentage of exclusive space used, as will its share of “actual, reasonable, direct, out-of-pocket costs related to the facility’s operation and maintenance,” according to the draft agreement language. RSU 14 Assistant Superintendent Christopher Howell estimated that the project will cost the district more than $3.2 million over the 40 years of the inter-local agreement, which he said was less than the cost of the district building its own facility. “It’s the most inexpensive way to do this (for the district),” he said Wednesday afternoon. Currently, the school district rents space at the existing Windham Public Works garage for $9,416 each year. District Superintendent Sanford Prince said he was comfortable with the draft agreement. The RSU 14 board was slated to receive a presentation on the agreement at its Sept. 5 meeting after the Lakes Region Weekly’s publication deadline. The proposed agreement comes in the midst of a withdrawal effort in RSU 14’s other member town, where there was no vote on the facility. Several Raymond officials have argued that having Raymond pay for a portion of the building’s cost through the RSU fails to adhere or is an end-around to the district’s cost sharing agreement. The building has been cited repeatedly during Raymond’s move to initiate the withdrawal process. Windham Town Councilor Rebecca Cummings asked Tuesday night if the withdrawal effort impacts the inter-local and lease agreements. “I don’t believe it does,” responded Bonnie Martinolich, a town attorney from Preti Flaherty who specializes in business law. Asked by a reporter about how the withdrawal process factored into the agreement discussions, Howell acknowledged that the possibility of withdrawal “is one of those things that you think about” in crafting such a document. “I think for the taxpayers, this is absolutely the right thing to do,” he added. The inter-local agreement includes language that makes it binding to any successor should the school district or town cease to exist in their current form. The Town Council did not take a vote on the draft agreement language Tuesday night. Councilor Clayton Haskell was the only councilor to indicate firm opposition to the agreement during the discussion, based on the fact that the language was not included when voters approved the bond last fall. Raymond Selectboard Chairwoman Teresa Sadak, who was one of the lone audience members at the Windham council meeting, said afterward that she agreed with Haskell. “He is so right,” Sadak said. Windham’s chairwoman had a different take. “I’m going to be supporting it, but I’m going to be watching those dollars,” Chapman said about the shared facility agreement. Prince said the School Board is expected to vote on the agreement Sept. 19. 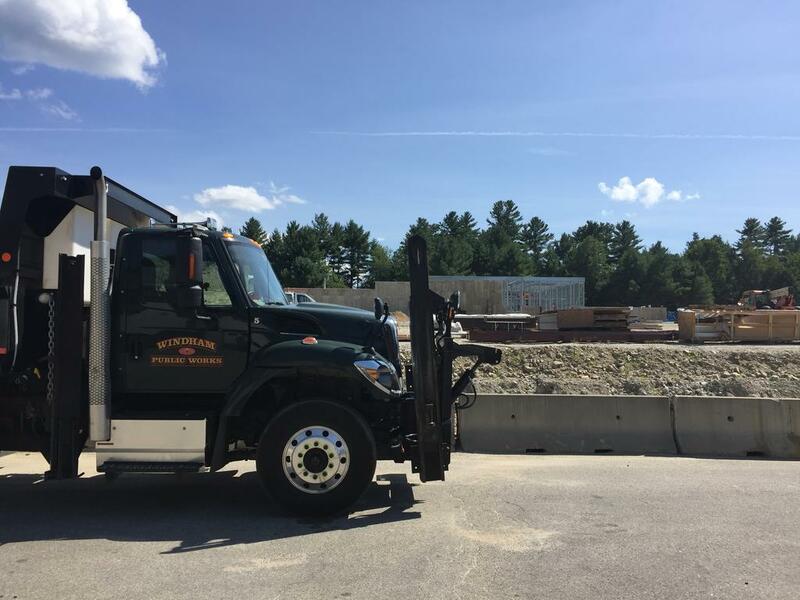 Construction continues at the new shared vehicle maintenance facility in Windham. The town and school district have settled on draft agreement language spelling out how the facility will be shared, both both boards still need to sign off before it can be finalized.